Info "Get all the statues to face the same direction." About Face is one of Orbulon's microgames in WarioWare: Twisted! 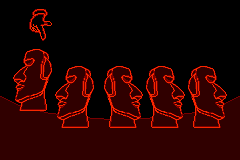 The game's objective is to get all the Moai statues face the same direction by turning them. 1st level difficulty: There are three statues, one is facing the wrong way. 2nd level difficulty: There are four statues, one is facing the wrong way. 3rd level difficulty: There are five statues, two are facing the wrong way. This page was last edited on September 26, 2018, at 20:41.